How Good is Your Smile? Before your initial visit ask yourself these questions so you can be sure to get the most from your consultation. I will offer you professional advice and solutions, but you must first identify the areas that concern you. Does this affect your confidence? Although the teeth have the greatest influence on the appearance of the smile, they are not the only factor that would make a beautiful smile. The shape and form of the lips as well as healthy gum tissue that does not show too much , all contribute to the smile that is perfect for you. Regardless whether you want a Hollywood smile or a more natural appearance, symmetry is essential for a beautiful smile. Symmetry around the centreline of our face is of great importance for an aesthetically pleasing smile. Even when this is not 100% possible, the illusion of symmetry should be created. 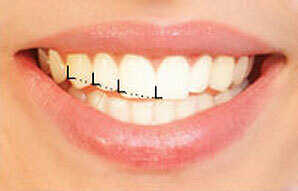 The front two upper central incisors should be symmetrical in size, length and shape. Ideally the smile line should be aligned so it is parallel to the horizontal. The edges of your upper teeth should follow the curvature of the lower lip when you smile. With a narrow smile, the side teeth are often in shadow. This leaves dark triangles at the corner s of the mouth. 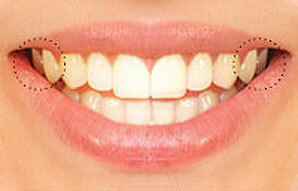 A wider smile allows one to see the ideal progression from the front to the back teeth, this is more attractive! The gum line connects the highest points of the gum levels(zenith) of the upper teeth. This height must be symmetrical on both sides of the mouth. Ideally this line should follow the line of the upper lip, to ensure minimum gum exposure and optimum display of the teeth on smiling. The upper lip should touch where the teeth meet the gum, although a small amount of visible gum tissue above the teeth is acceptable (2mm). The main axis of the tooth inclines backward from tip to gum. This inclination increases from the incisors to the canines. It is lowest on central incisors and gradually move upwards towards the canines. The shape of the tooth will influence this contact point. Due to individual variations, it is difficult to provide "magic numbers" like the golden proportion, to define adequate tooth dimension and relative proportion. Perception of symmetry , dominance and proportion are influenced by many factors, and should be adapted for every personal smile. A young smile has a "gull" shape whereas a more mature smile exhibits a flatter appearance. Interincisal Angles are the small triangular spaces between the tips of the teeth. These are artistically created by the ceramist and dentist to ensure a natural look. Lips are to teeth as a frame is to a picture! The shape, fullness and symmetry of your lips can be optimised for the ideal smile. 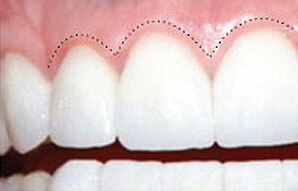 Gum tissue should have a light pink colour and firm texture without any swelling or bleeding. The papillae must completely fill the gap between teeth to avoid any visible black triangles.